Vikasa Tarangini Mahila Arogya Vikas conducted Cancer Awareness and Detection Camp at Old Raja Rajeswari Peta in Krishna District on 9th July 2017 with the help of Mutyalampadu Arogya Vikas Volunteer V. Jaya Lakshmi. 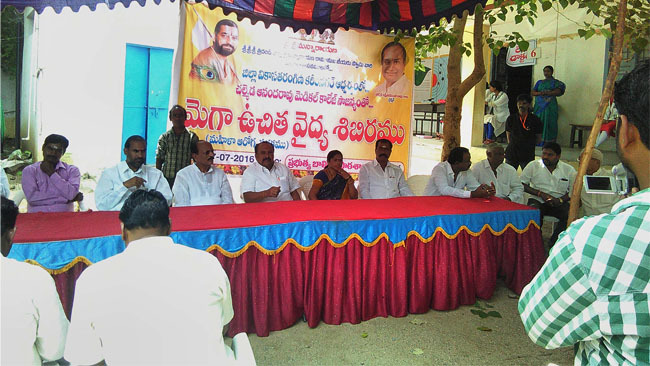 The camp was organized in Old Raja Rajeswari Peta S.S.R., Upper Primary School. School Head Mistress M Kusumaji also actively participated in conducting the health camp smoothly. In the camp premises, Dr. V. Sri Latha took one Biopsy for a patient. The doctor recommended USGs for 5 ladies but only 3 of them came to NRI along with the Mahila Arogya Vikas volunteers for examination. 3 breast related cases were identified but only one patient came to NRI Hospital. FNAC test was done and results are expected soon. If the results are negative for cancer, operation will be performed on Thursday ( i.e., 13th July 2017). If it is a cancer case, the patient will be sent to Gopi Chand Hospital . In the camp, Dr. V. Sri Latha and B. Usha Rani spent their valuable time and actively participated by contributing wonderful services. 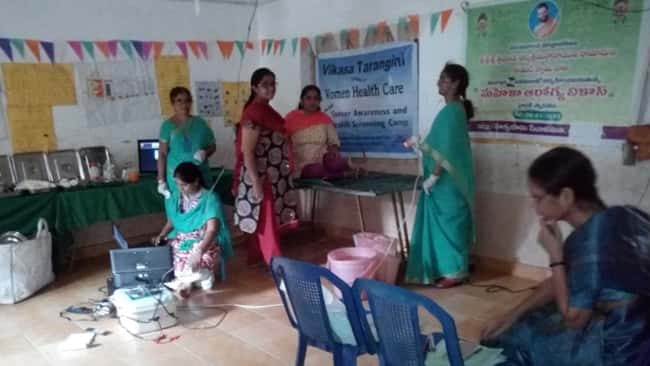 Arogya Vikas volunteers D.Tulasi, M.Durga Lakshmi, M. Naga Jyothi, M. Naga Sri and G. Vijaya Lakshmi worked as a team and conducted the camp successfully.